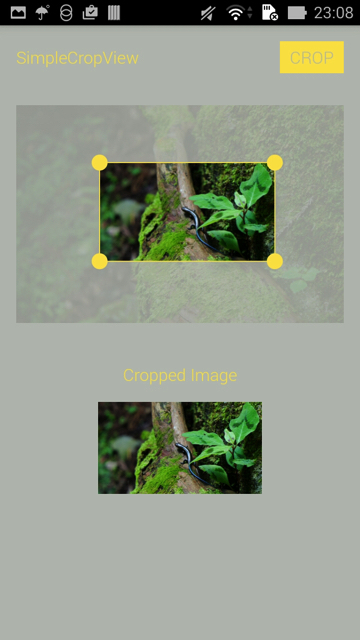 A simple image cropping library for Android. 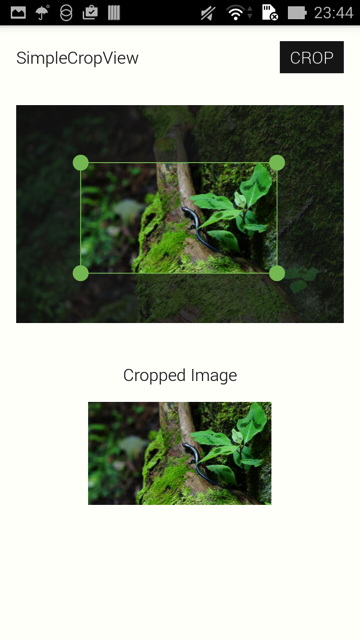 It simplifies your code for cropping image and provides an easily customizable UI. Supported on API Level 10 and above. Include the following dependency in your build.gradle file. Please use the latest version available. Add permission in AndroidManifest.xml file. Add the com.isseiaoki.simplecropview.CropImageView to your layout XML file. NOTE: The image is scaled to fit the size of the view by maintaining the aspect ratio. WRAP_CONTENT will be ignored. 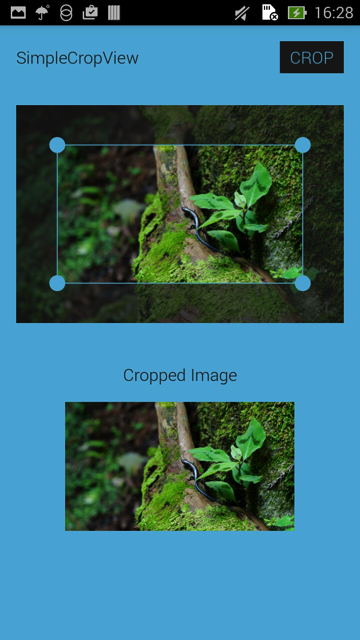 Crop image and save cropped bitmap in saveUri. SimpleCropView supports rotation by 90 degrees. For a working implementation of this project, see sample project. These method load Bitmap in efficient size from sourceUri. You don't have to care for filePath and image size. You can also use Picasso or Glide. You can use blurred image for placeholder. These cropping method use full size bitmap taken from sourceUri for cropping. If sourceUri is null, the Uri set in load(Uri) is used. 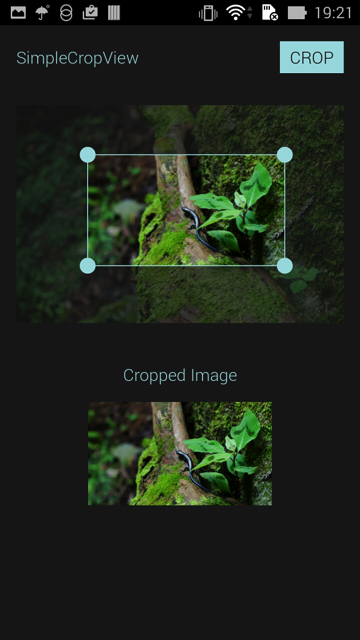 After cropping, it saves cropped image in saveUri. You can use 3 compress format, PNG(default),JPEG, and WEBP. You can set max size for output image. The output image will be scaled within given rect. You can also set fixed output width/height. 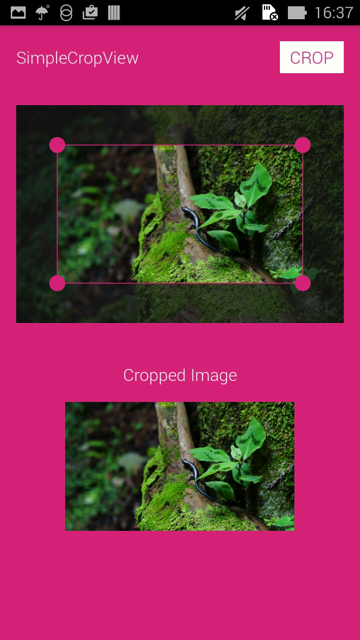 The option for the aspect ratio of the image cropping frame. FREE: Non-Fixed aspect ratio mode RATIO_X_Y, SQUARE: Fixed aspect ratio mode FIT_IMAGE: Fixed aspect ratio mode. The same aspect ratio as the original photo. You can save and restore frame rect as follows. See sample project for more details. 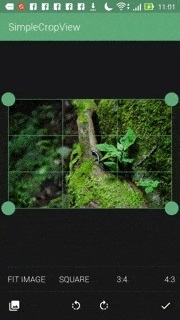 Additional touch area for the image cropping frame handle. 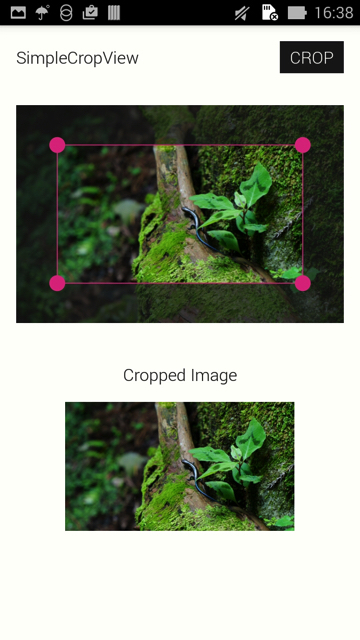 SimpleCropView supports rotate animation and frame change animation. Toggle whether to animate. true is default. Set animation duration in milliseconds. 100 is default. Set interpolator of animation. DecelerateInterpolator is default. You can also use your custom interpolator. Some option does not work correctly because CropImageView does not support ImageView.ScaleType. You can use debug display.